Irrespective of what kind of boat you own, it’s a safe bet that at some point you’ll experience the ‘joy’ of a fouled prop. 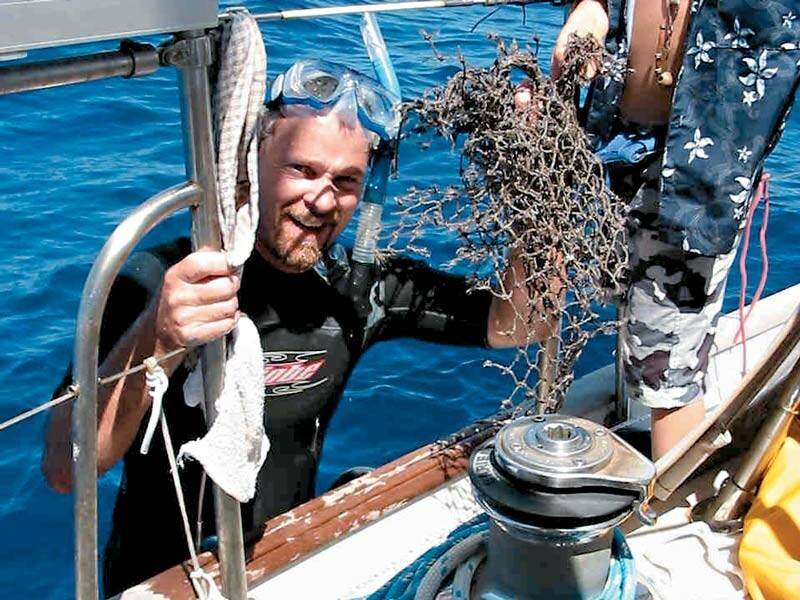 Typical culprits include mooring lines, anchor ropes, dinghy painters, fishing lines and nets, and even plastic packets. As always, the best strategy is avoidance – reduce the chances of getting the prop fouled in the first place. On yachts, be aware of a trailing head-sail or spinnaker sheet that could get caught. If towing a tender, use a polypropylene rope as the painter – polypropylene floats and is less likely to get caught in the prop. When manoeuvring or docking, make a crew member responsible for the painter – and get them to pull it in short. Keep a sharp lookout when traveling through areas with longlines, buoys and craypots. Still, a fouled prop cannot be avoided for ever and the first rule is: don’t panic. Many accidents result from people making poor decisions in the initial stages of an incident. When trying to un-foul the prop – consider your options carefully and think calmly. For example, your first action could be deploying the anchor to prevent drifting on to a lee shore. These are usually relatively easy to free, given that the engine can be tilted out of the water, allowing you to unwind or cut the offending rope or fishing line. However care is needed as the boat can easily become unstable in this situation. Typically, two or three people crowd around the engine to sort out the problem, and the bow, now sitting higher, turns off the wind and this presents a lower transom to the waves, which can easily slop over the transom and swamp the boat. The solution is to balance the boat by positioning the crew appropriately. Anchor the boat first if it’s shallow enough. It goes without saying that a sharp, serrated knife must be part of your permanent, on-board equipment. These present more of a problem in that the prop(s) remain underwater. Many people immediately jump overboard with a snorkel and knife and attempt to cut the rope free. Again, you need to think carefully – this option should only be entertained if you or one of the crew are a strong swimmer. If possible anchor the boat. Consider that the water might be extremely cold and the current strong – both will cause you to tire quickly. Ensure there is a boarding ladder deployed, or some other means to get back on-board and tie a rope around the person going over as a safety measure. If you’re lucky, you might be able to manually turn the propshaft (from inside the boat) and untangle the mess. Depending on the complexity of the foul, alternative strategies can be adopted. If your initial inspection shows that the rope is tangled in one direction, and only around the shaft, you might be able to put the engine in reverse. Climb back on board, and holding on to the appropriate end of the fouled line, MOMENTARILY put the engine into reverse. Keep pulling on the line. DO NOT wrap your hands around the rope – you’ll need to let it go immediately if it ‘grabs’ again. Once the prop has been freed engage gear and apply power carefully. 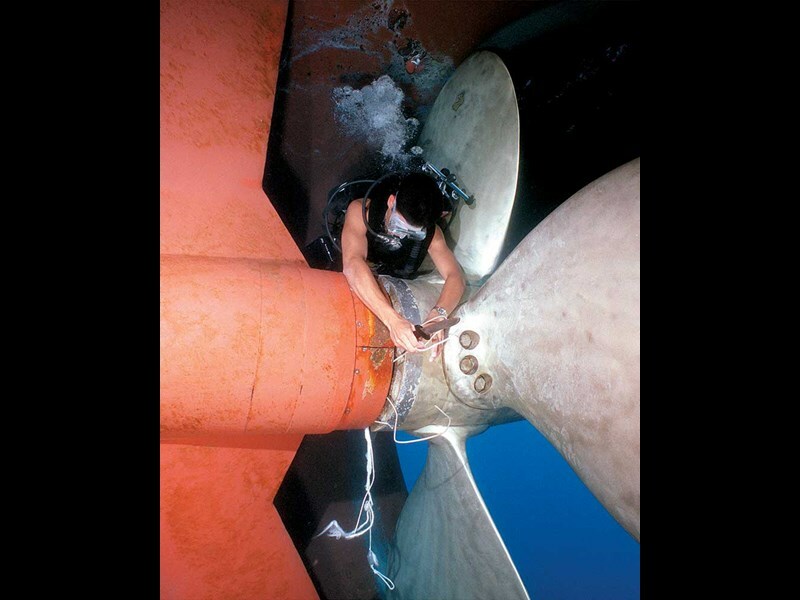 It’s possible that the fouling might have damaged the propeller, the stern tube, or the prop shaft bearings. Be particularly alert for any vibration or water ingress. 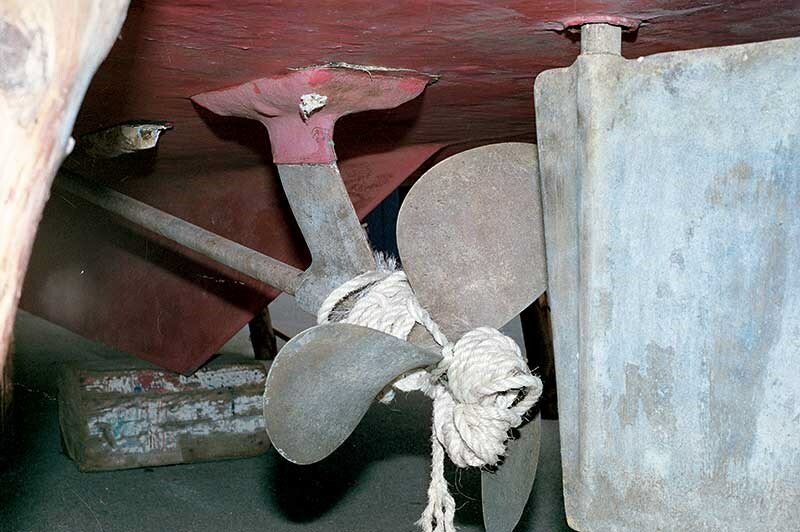 A sensible "anti-foul" accessory for any boat is a prop protector/rope stripper. They are available for outboard engines, saildrives and fixed prop vessels. Typically, these units are stainless disc/blade cutters secured to the prop shaft just forward of the prop. They are easily retrofitted, and can be installed by a diver in a few minutes. On outboard engines, the cutter is fitted to the engine housing, just forward of the propeller. If all else fails, and the prop remains stubbornly entangled, call the Coastguard for assistance.